The Madison Commercial Loan Portfolio Management System is a comprehensive set of tools, analytics and reports for the risk management and administration of commercial loan portfolios, with an emphasis on the unique requirements of commercial real estate loans. This commercial loan software makes it easy to maintain current, accurate information about your loan portfolio and provide comprehensive reports to monitor its credit quality. Commercial Loan Risk Management. This remarkable system enhances risk management with many embedded analytics such as stress testing, loan rating migration, credit policy exception tracking, loan covenants, and comprehensive credit quality reporting. You can quickly identify your exposure to tenants, borrowers, and industries. And the easy to use filter system allows you to focus on important sub-segments of the portfolio that merit special attention. Commercial Loan Portfolio Administration. Commercial loan administration is made easier with the extensive and flexible tickler system that will remind you when financial statements, tax returns, operating statement, valuations or other information is due. You can create letters and emails requesting data, including a description of the most recent information in your files and the requested data. Together with robust data validation and administrative reports, portfolio administration will be easier than ever before. The highly flexible and robust System will help you increase efficiency and improve risk management of the entire commercial lending process. You can easily and quickly respond to questions about the portfolio’s condition. 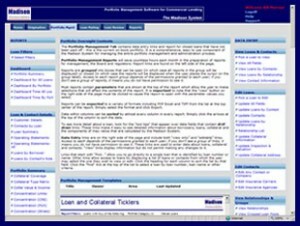 The many features of the Madison Portfolio Management provide unprecedented ease of use. Stress Test. Quickly and efficiently apply your stress test values to all loans in the portfolio to verify their ability to withstand adverse environments and identify weaker loans. Estimate defaults, losses and loan loss reserves. Ticklers. A comprehensive tickler system will remind users of information that needs to be updated before it is due, and also provide reminders when information is late. Letters and emails can be created to request needed information. Save Documents. Any electronic file can be saved in the Madison System so that you can maintain all the information that supports items such as the loan rating, collateral valuation, collateral income, borrower financial statements, etc. Loan Covenants. Maintain detail information about all loan covenants. Loan Policy Exceptions. Track loan policy exceptions. Monitor Credit Quality. Credit quality can be monitored easily with a wide range of reports such as delinquency, FASB 114, watch list, loan rating migration, stress tests, tenant exposure, industry exposure, and many, many more. Historical Information. The Madison System saves historical information about values such as loan balances, payments, ratings, as well as collateral and business income, valuation, inspection, occupancy and so on. Loan Migration Analysis. View how loan ratings have changed over time. Track Collateral Performance. Monitor current and historical information for valuations, income, inspections, occupancy, insurance, taxes, tenants, rent rolls, as well as construction progress and budgets. Borrower Financial Statements and Tax Returns. Maintain current borrower financial statements and tax returns. Business and Collateral Operating Statements. Keep on top of financial statements based on a client specified set of charts of accounts. Charts of accounts can be further customized by adding and deleting rows for each business or collateral. Borrower and Tenant Exposure. You can monitor exposure to individual borrowers or tenants, or groups of borrowers and tenants. Also monitor exposure by borrower or tenant industry (or by loan industry).